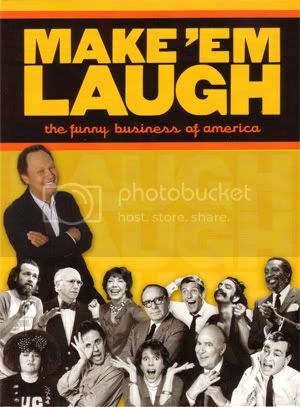 Hosted by Billy Crystal and narrated by Amy Sedaries, this six-part documentary series explores the work of the large variety of comics who have managed to make America laugh for over a hundred years. Showcasing some of the funniest moments in American entertainment and candid interviews with many of the groundbreaking comics themselves. Make 'Em Laugh is the first primetime television series to look beyond the 'pie in the face' to the face behind the pie". - Anne Beatts - Comedy writer and series consultant. This was shown in Australia on the ABC earlier this year and what a treat it was. I've always had such great admiration for stand up comics; when they are up on that stage they're like gods, they're untouchable and they can murder an entire audience of hundreds with nothing but laughter. It's obvious that a lot of time and effort has been put into to create excellent series. The countless variety of hilarious clips have been carefully chosen to showcases the very best in the business and how their work influenced their peers and future generations of comics. The interviews are all very interesting, full of stories and personal experiences of who and what help shaped and influenced them to become the comics they are today. I learnt so much from this series, such as complexity of being a stand up comic, and how it's not just simply getting up on stage with a microphone telling jokes. Overall this is a first class series that has been produced to the highest standards. If you are a fan of this form of entertainment I cannot recommend it enough. There are three discs containing two episodes each along with bonus content which includes interview outtakes and favourite jokes. Picture quality is excellent and looks great up-scaled on a high definition screen. Might just be me, but I find US stand-up to be unbearable for the most part, because of the 'look at me, I'm zany' quality. In particular I can't stand Jerry Seinfeld. Painful to watch. The only one I can think of I really like is Rich Hall. Give me a good old UK/Oz/Irish comedian any day. Al Murray, Jimmy Carr, Frankie Boyle, Omid Djalili, Jim Jefferies, Sean Lock, Dara O Briain, Ed Byrne, Milton Jones, Kevin Bishop, Ken Dodd, Roy Chubby Brown (for all his sins) etc etc are all far better. Same TV wise. I can watch (and enjoy) most of the sitcoms but the only ones I love are Scrubs and Frasier. Again, nothing on what the UK have to offer IMO. I love the fact we have six episodes and call it quits well ahead instead of dragging it out for 300 episodes until it all goes to crap. Are you a fan of Hale and Pace? It's been a while since I've seen any but yeah. Like any sketch show, hit and miss but they're decent enough. I just watched Series 2 of Porridge today which I can't recommend to comedy fans enough. Fantastic show. Also, a good recent sketch show from the UK is Man Stroke Woman (youtube some clips) starring Nick Frost. Really dug that. Might just be me, but I find US stand-up to be unbearable for the most part, because of the 'look at me, I'm zany' quality. You should try and check out Bill Hicks, I think you'd like his style of humor.